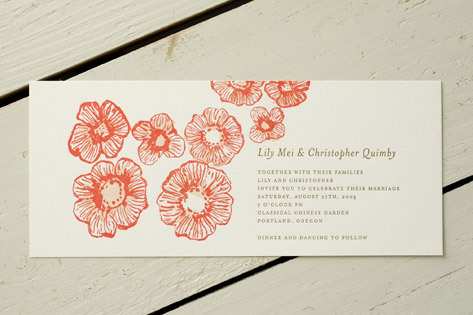 Bold, vibrant poppies embellish this letterpress wedding invitation, creating a mood of lighthearted whimsy and setting the state for a fun wedding celebration. The event details are set in classic type, providing a nice balance and making this suite a great choice for spring, summer, and outdoor weddings. Available in melon/bright red/brown (shown), teal/grey-green, lavender/brown, and brown. Fonts shown are Mrs. Eaves Italic and Mrs. Eaves Uppercase.